This theatre was the brain child of Lawrence du Garde Peach, known as ‘Laurie’. He was born in 1890 in Sheffield, but brought up in Great Hucklow, Derbyshire, where his father was the pastor of the Unitarian Old Chapel. Educated at Manchester Grammar School, Manchester University and Gottingen University, where he learnt fluent German, and after a spell in the trenches, which included put­ting on plays with the troops, he spent the rest of WW1 in the Intelligence Corps inter­rog­at­ing German sol­diers. He com­pleted his formal edu­ca­tion in 1921, with a PhD at Sheffield University in drama. After a short time in Academia, at what is now Exeter University, he took up full time writ­ing and went back to live in Great Hucklow, where his father was still the pastor, and the pop­u­la­tion was 90. He wrote for radio, films, magazines, includ­ing ’Punch’, and for theatre. He became edit­ing author for the Ladybird his­tory books, and wrote Toytown scripts for ‘Childrens Hour’ on the BBC, as well as some of the Ladybird books. He did pageants, made cards, painted, and even found time to stand for Parliament as a Liberal can­did­ate for Derby, but unsuc­cess­fully. His father at this time had set up a hol­i­day home for chil­dren in Nissan huts in the vil­lage, which Laurie adap­ted as a theatre, and in 1925 The Village Players were formed, a com­pletely ama­teur group of vil­la­gers, per­form­ing in the Nissan hut. There was no power, so plays coin­cided with the full moon or were lit by oil lamps or bat­ter­ies that had been bor­rowed. The first play was ‘The Merchant of Venice’ which ran for 3 nights at 8pm – 1s2d admis­sion, chil­dren 6d. Other plays included the ‘Scottish Play’ and ‘Clive of India’. ‘Journeys End was the only WW1 play that was per­formed. Costumes were hired and the dress­ing rooms i.e.the wings, were out­side, which was alright, in the right weather and there was no snow. The ama­teur vil­lage actors were invited to act, and if there was no new script for you for the next play after your per­form­ance, you knew you were not wanted in fur­ther plays. This con­tin­ued until 1937, when a new min­is­ter was appoin­ted and the Nissan huts were required for another use. So a barn adja­cent to the remains of the vil­lage lead mine was pur­chased, with the help of a ’loan’ (which was never repaid) from the Sheffield indus­tri­al­ist J.G.Graves, and con­ver­ted into a pro­scen­ium theatre with an aud­it­or­ium of 250 seats (acquired from Montgomery Hall at 6d each) on a slope. In 1938, they moved in. The first play was ‘Shells’ about WW1, and was writ­ten by Laurie. The next play was ‘Mrs. Grundy comes to Tea’, but in 1939 and during WW2, the theatre closed and the actors joined the Home Guard. The theatre was used as a club for chil­dren. Recommencing after the war, per­form­ances were always full. There were 3 plays per year with 3 weeks rehearsal and 3 weeks per­form­ances on 6 days /week + 3 mat­in­ees i.e. 21 per­form­ances. The list of plays per­formed was ambi­tious and varied. 4 local men did the stage set­tings, which were always pro­fes­sional. Lauries wife was the prompt and some­times fell asleep. Programmes were free. Refreshments at half time were sup­plied by a mobile van, nick­named ‘The Desert Rat’, appar­ently not to be recom­men­ded. There were some­times com­plaints that there were too many plays writ­ten by Laurie, so he wrote one under an assumed name, with a glow­ing descrip­tion of this person, which was of course him. In 1954 Laurie wrote a play on vil­lage life and even wrote plays around vil­lage char­ac­ters. In fact he did nearly everything, includ­ing writ­ing Newsletters which were highly amus­ing. Audiences came from all over the world and famous actors per­formed there. Edna Raiworth, the grand­mother of Sophie Raiworth of telly fame, was first lady in many plays there. By 1971, Lauries wife was not well, and des­pite being encour­aged to con­tinue, Laurie said ‘When you’ve fin­ished with a toy, you throw it away’. The theatre was sold to the Sheffield Scout Association with the con­di­tion that it should never be used for per­form­ances again. ‘To the Manor Born’ was the last play and every­one involved received a letter of thanks for their con­tri­bu­tions. Lawrence du Garde Peach died in 1974. There is a plaque on the side of the barn where the action took place. A small trib­ute to a remark­able achieve­ment, by a remark­able man who gave so much pleas­ure to so many, espe­cially in Great Hucklow. How do you write a blog on a magi­cian? Well. Here goes. This was Dave’s third end of year talk to us in suc­ces­sion, (which speaks for itself), put­ting us well and truly in the hol­i­day mood, with another, and dif­fer­ent, enter­tain­ing per­form­ance of magic, comedy and music. As a Jeremy Corbyn look-alike, he star­ted with some magic involving cards, money and sleight of hand. Awesome! - He was on Countdown once with the girl in the short skirt, who has taken over from Carol Vorderman. He got excited – a seven letter word. The sum of the num­bers in three of the mem­bers birth dates didn’t quite tally with Dave’s pre­dic­tion, but he said he didn’t want to appear too pro­fes­sional! We should have low expect­a­tions, then we would enjoy it. A man with a long stick walked into a pub and the barman said ‘Are you a pole vaulter?’ He replied ‘ No I’m German, but how did you know my name was Walter? We’ve just had the 2 worst win­ters on record – Mike and Bernie! What’s the dif­fer­ence between a Chiropodist and a Drummer? Can you remem­ber? I can’t read my notes as I was laugh­ing too much! A recruit for the army was having his med­ical, and the Doctor said ‘You’re not very well endowed’ to which he said ‘I thought we were only sup­posed to be fight­ing the Germans’. Dave had a mince pie once dir­ectly in the face. He thought ‘Either they are get­ting more accur­ate, or I’m get­ting slower’. After a rous­ing couple of songs accom­pa­ny­ing him­self on the guitar, a lady was crying in the front row. He said ‘I’m glad you enjoyed that’. She said ‘I didn’t. I’m a musi­cian’. Dave involved some unsus­pect­ing Probus mem­bers, seem­ingly des­troy­ing their £20 note, bam­booz­ling them with sleight of hand, and get­ting Graham to blow a bazooka! You should take it up pro­fes­sion­ally Graham! Only joking. A very enter­tain­ing morn­ing, which sent us home smil­ing. Tim is a volun­teer local arch­iv­ist for ‘’Peak in the Past’’ which is a com­munity her­it­age group com­pris­ing a small col­lect­ive of indi­vidu­als with a shared pas­sion for the Derbyshire Peak District and its past. Teaming up with his High Peak Journalist sister Holly, Tim has, from humble begin­nings in 2014, obtained fin­an­cial sup­port to enable the group to work with school­chil­dren, inspir­ing and enga­ging them in their local his­tory, through to eld­erly res­id­ents in res­id­en­tial care homes, gath­er­ing remin­is­cences. With gen­eral his­tory from ori­ginal archive sources, the group gives talks & has made films to reflect & con­trib­ute towards the import­ant sense of regional belong­ing, pride & iden­tity, to help strengthen & enrich com­munity cohe­sion. The excel­lent illus­trated talk focused on local his­tory and com­munity events, rooted in the real lives of hard work­ing, some­times impov­er­ished rural folk, where the chances to travel away, were not as they are today. Empire Day on 24th May, which was Queen Victorias’ birth­day and sub­sequently became Commonwealth Day on Queen Elizabeth IIs’ birth­day. Bakewell Show, star­ted in 1819, and Bakewell Carnival. The choos­ing of Miss Village from the local beau­ties. Schools held a more prom­in­ent role in the smal­ler com­munit­ies. Corporal pun­ish­ment was meted out at school & the chil­dren were sub­jec­ted to some­times tough regimes. The churches were more at the centres of com­munity life with Sunday schools, choirs, girl guides, scouts, womens’ groups, fest­ivals, and sports teams of cricket, foot­ball, tennis, and tug-o-war. In the smal­ler com­munit­ies enter­tain­ment was avail­able in the form of cinemas, Whist Drives, and theatre, in par­tic­u­lar the legendary Great Hucklow Village Players (1927–71) foun­ded by Dr. Du Guard Peach, which had a world­wide repu­ta­tion. Pubs, Clubs and Institutes played a major part in vil­lage life, with Ex-Servicemens clubs, and the Mechanical Institute of Eyam prom­in­ent. There was a vil­lage police­man sup­por­ted by Special Constables from volun­teers in the vil­lage, and local emer­gency fire and ambu­lance ser­vices with cot­tage hos­pit­als in nearby larger towns. WW2 brought evacu­ees to the area, and the Nightingale Institute for Guernsey evacu­ees at Great Hucklow was foun­ded. POW camps were set up in Stoney Middleton and the quarry was bombed to try to stop pro­duc­tion, even though some of the work­ers were POWs. Bombs were also stored at Stoney Middleton. There was the inev­it­able loss of life amongst those who joined up for both world wars, remembered with prom­in­ent monu­ments and reg­u­lar memorial ser­vices. Transport devel­op­ments changed hori­zons, with the Railway, cars, & sub­sequent road improve­ments. Winnats Pass was sur­faced in the 1930s & the AA man with his motor­bike and side­car appeared. The horse and cart deliv­ery meth­ods were dying out. Attitudes were chan­ging and the Kinder Trespass took place in 1932. More leis­ure time was being taken which lead to Caving, Rambling, Climbing, and the first National Park in 1951. Employment was centred around mining, espe­cially for lead and fluor­spar. Farming and agri­cul­ture and the mills at Bamford (closed 1965), Litton (1960), and Cressbrook (1971) were big employ­ers. The Hope Cement Works since 1945 is still a big pro­du­cer and employer. There is a time­less splend­our to the Peak District, even with the pres­sures on it, like the flood­ing of Ashopton in the Derwent valley, to con­struct the dams, but the talk show­cased how an import­ant cul­tural her­it­age role is help­ing to pre­serve the past in the Peak District, which is integ­ral to its endur­ing appeal, its con­tin­ued envir­on­mental pro­tec­tion and its long-term sur­vival. We’re very lucky to have volun­teers like Tim doing this work. More power to your elbow! Howard, a reg­u­lar speaker at our Probus, explained that today’s’ illus­trated talk was aimed at encour­aging us to observe and under­stand the remain­ing vis­ible signs of Sheffield’s past, some of which we don’t nor­mally notice or appre­ci­ate. These ranged from pre-Roman and Anglo Saxon times to the Viking and Norman influ­ence, through to times when the area was a col­lec­tion of small vil­lages exist­ing on pas­toral farm­land with feudal land­lords and on to the devel­op­ment of the steel and cut­lery indus­tries in the Industrial Revolution, when the pop­u­la­tion expan­ded, and Sheffield was at the fore­front of world events. Street names – Pinfold St., denot­ing a stray animal pen, always at the edge of town. Racker Way (Nr. Malin Bridge) a Viking word for a pack­horse. Long Line in Dore – ori­gin­ally Long Lane drawn as a bound­ary on a map, which changed its name when the Sheffield bound­ary moved from the Limb Brook to the Burbage Brook. Stumperlowe — a stump on a mound. Cotton Mill Rd (offCorporation St)– Near Kelham Island which (sur­prise, sur­prise) sig­ni­fied a cotton mill, which became a silk mill then West Bar Workhouse, now all long gone. Scarsdale Rd. – sig­ni­fy­ing the owner of the land, who altered the name from Green Lane when he bought the land. Stanley Rd. – Was this because of the man who found Livingstone? Lismore Rd. – used to be Livingstone Rd. but it was changed when the bound­ary was moved as they already had a Livingstone Rd. in the new area. The Cricketers Arms on Bramall Lane – a reminder of where ini­tially, cricket was played more ser­i­ously than foot­ball, but cricket was scrapped in 1972 and it is now the home of Sheffield United. The pub is gone. The elab­or­ate Gas Light built by the Duke of Norfolk out­side his park – obvi­ously not built by the Council! The Georgian ‘Bankers House’ in Campo Lane which was on the out­skirts of the town when built in 1728 and was a sign of the start of an edu­cated middle class and the demise of the feudal lords system. Red Post Boxes – (Cannon Iron Works Falkirk is writ­ten on each one) – The 1st iron works in Scotland was set up by John Roebuck from Meersbrook House (built by a banker), when the Meers Brook was the county bound­ary. Roebuck was a chem­ist & whose part­ner was James Watt. James Watt even­tu­ally joined up with Matthew Bolton to make the steam engine. Two gate­keep­ers lodges (look­ing like toll houses) for the gated com­munity of Collegiate Crescent. A pack­horse bridge near Rails Rd. in the Rivelin Valley. In Savile St – there is a sign on a post with the insignia ‘’Court 12 o’clock’’. This was the site of a public clock which was always broken, so it was fixed to read 12 o’clock at all times. A depot for Sheffield horse-drawn trams, but 1899 saw the 1st Electric tram. It sub­sequently became a depot for the bin lor­ries, then apart­ments. We used to build our own trams & rails!! The Pub ‘The Tramway’ built to com­mem­or­ate the tram, now gone. The Steps on London Rd. near Homebase were installed in 1902 – This was the tram ter­minus, but it soon moved fur­ther out to Abbey Rd/Graves Park area, leav­ing the steps little used. Meadowhead was ori­gin­ally at the junc­tion of Abbey Lane & Chesterfield Rd. as the mead­ows star­ted here. These mead­ows were sub­sequently built on, so the present Meadowhead moved, to reflect the new pos­i­tion of the open mead­ows. The last slide was a reminder of the fant­astic coun­tryside on our door­step. A walk around the Sheffield area won’t be the same again. David, a reg­u­lar speaker at our Probus, is an Elizabethan Historian, a nation­ally known speaker and Chair of The Friends of Sheffield Manor Lodge. He became a guide at Manor Lodge in 2004, at which time he could find only a single chapter to read about Mary Queen of Scots and her 19 years of cap­tiv­ity in the Sheffield area. David chose to talk to us about this period of cap­tiv­ity, which he has since researched and writ­ten about in his new book “Mary Queen of Scots – The Captive Queen in England, 1568–87,’’ and which has been 12 years in the making. 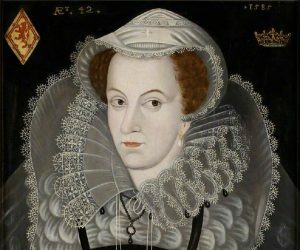 Mary, born in 1542, became the right­ful Queen of Scotland when very young. She was a cousin of Queen Elizabeth I, both being related to Henry VIII. But Mary, the daugh­ter of the Scottish King James V, was a Catholic, and Queen Elizabeth of England was a Protestant. Protestants gained con­trol of Scotland during Mary’s youth, so she escaped to France but returned to Scotland to reign in 1561, at the age of 18. Still a Catholic, she reigned as Queen and had a son James with her first hus­band, Lord Darnley. This mar­riage and the sub­sequent one were con­tro­ver­sial and dis­astrous, neither of which had been sanc­tioned by Elizabeth as pro­tocol deman­ded. Mary’s right to reign was even­tu­ally chal­lenged and she ended up in a Scottish prison. However, she escaped and sailed for England, land­ing at Workington on 16th May 1568 against all advice, and totally unan­nounced, in the hope that Elizabeth would help her to regain her Scottish throne as she had once pre­vi­ously prom­ised. But Elizabeth now had a prob­lem with a Catholic Queen on Protestant English soil. Initially, Mary was held in Carlisle Castle, but within three or four months she was moved south to Bolton Castle in Wensleydale, away from the coast and the Scottish border for secur­ity. Elizabeth had con­cluded that she was a threat to her throne and could become a Catholic ral­ly­ing point for English revolts, or inva­sions from Spain, France or Scotland. For that reason, she could not release her and needed to keep her in the easi­est place to defend, should there be an attempt to rescue her. To begin with, a con­fer­ence in York was con­vened to estab­lish the facts about her mar­riages, with a view to resolv­ing her pos­i­tion in Scotland, but this was incon­clus­ive. Mary was then moved fur­ther south, and fur­ther from the sea, to secure places cent­ring on Sheffield. The sixth Earl of Shrewsbury, at his own cost, was engaged by Elizabeth to be Mary’s ‘jailer.’ The main loc­a­tions used to hold Mary over the next 19 years were, Tutbury Castle, Wingfield Manor, Worksop Manor, Chatsworth, Sheffield Castle, and Sheffield Manor Lodge. The Earl’s wife, Bess of Hardwick Hall and Chatsworth, was a friend of Elizabeth and helped to look after Mary, as well as keep an eye on her. Some of the places were unhealthy, so Marys’ health deteri­or­ated, even though she was per­mit­ted occa­sion­ally to take the waters at Buxton, when she stayed at what is now the Old Hall Hotel. So we had Mary, on the one hand, involved in intrigues and plots, and Elizabeth, on the other, impris­on­ing Mary and thwart­ing any Catholic plots to under­mine her, or the estab­lished Protestant faith. Sir Francis Walsingham, the spy­mas­ter, and Sir William Cecil, Elizabeth’s main advisor, were strong advoc­ates for execut­ing Mary, to solve the prob­lem. However, mon­archs believe that they are chosen by God to reign, so Elizabeth couldn’t bring her­self to sign the death war­rant of another mon­arch. The Duke of Norfolk, one of the most influ­en­tial per­sons in England, and a Catholic, plot­ted to marry Mary and take over the throne. He was even­tu­ally executed for treason, with Elizabeth sign­ing the death war­rant. A revolt (the only one during Elizabeth’s reign) came from the Northern earls in the Catholic North of England, but this petered out. Of the lead­ers, Northumberland was tracked down. Reprisals in the North, by Elizabeth’s army, were ruth­less, to dis­cour­age any other revolts. The other leader, Charles Neville, escaped to Spain but had all his prop­erty con­fis­cated. Three attempts were made to escape from the Earl of Shrewsbury’s prop­er­ties and four attempts were made from Sheffield Castle. But there were spies every­where, who dis­covered all the plots, which came to noth­ing. Relationships slowly deteri­or­ated between all the parties involved in Mary’s deten­tion. The Earl’s mar­riage fell apart as well as his health and fin­ances, and Mary’s health suffered because of the con­di­tions under which she was held. From being a sporty person used to hunt­ing, fal­conry, arch­ery and real tennis, her move­ments became very restric­ted as plots to rescue her came and went. So she spent her time doing embroid­ery, which is now on exhib­i­tion in Oxford, Norfolk and Edinburgh. Finally, one of the plots — in which it was proved that Mary was implic­ated — was deemed to be treas­on­ous, so even­tu­ally Elizabeth reluct­antly signed Marys’ death war­rant and at the age of 44 she was executed. She died for her faith at Fotheringhay Castle. Elizabeth was said to have ‘won’ in life, but ‘lost’ in death, as iron­ic­ally, James VI of Scotland, Mary’s son, who was a Protestant, also became James I of England when Elizabeth died. This was the first time both coun­tries had had the same mon­arch. We learnt that there is a film being made at a cost of £180m on this sub­ject, which is due to be released in January 2019. It was a very enlight­en­ing and enjoy­able hour. For more inform­a­tion, David’s book gives it all.